Eric Mussen (center) with Gene Brandi, president of the American Beekeeping Federation, and Joan Gunter, president of the Foundation for the Preservation of Honey Bees. Internationally known honey bee guru Eric Mussen, Extension apiculturist emeritus, drew a rousing, standing ovation on Jan. 12 at the 75th annual American Beekeeping Federation's conference in Reno. 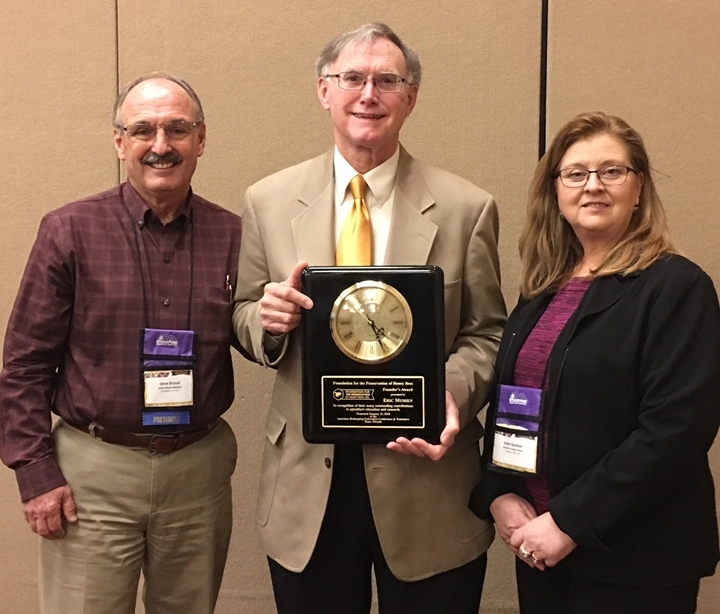 To his surprise, Mussen received the 2018 Founders' Award from the Foundation for the Preservation of Honey Bees, at the 75th annual American Beekeeping Federation (ABF) conference in Reno. 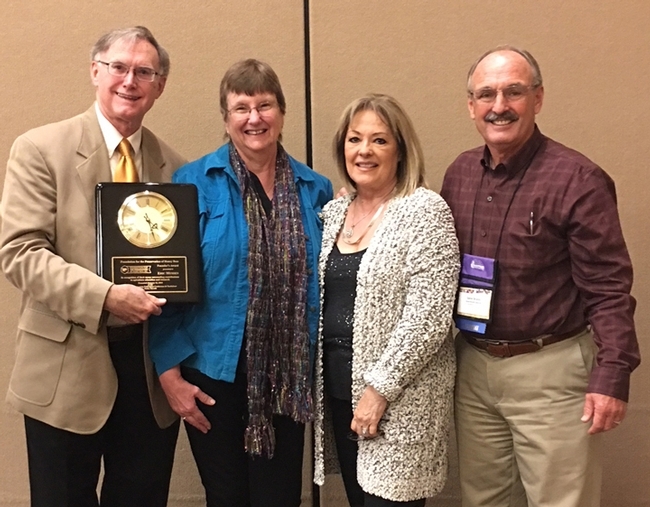 ABF president Gene Brandi of Los Banos, who presented him with the plaque, praised him as a outstanding liaison between the academic world of apiculture and real world beekeeping and crop pollination. Mussen turned down a football scholarship at Harvard to attend the University of Massachusetts, Amherst, where he obtained his bachelor's degree in entomology. This is also where he met Helen, his wife of 48 years. He holds a master's degree and doctorate in entomology from the University of Minnesota, St. Paul. 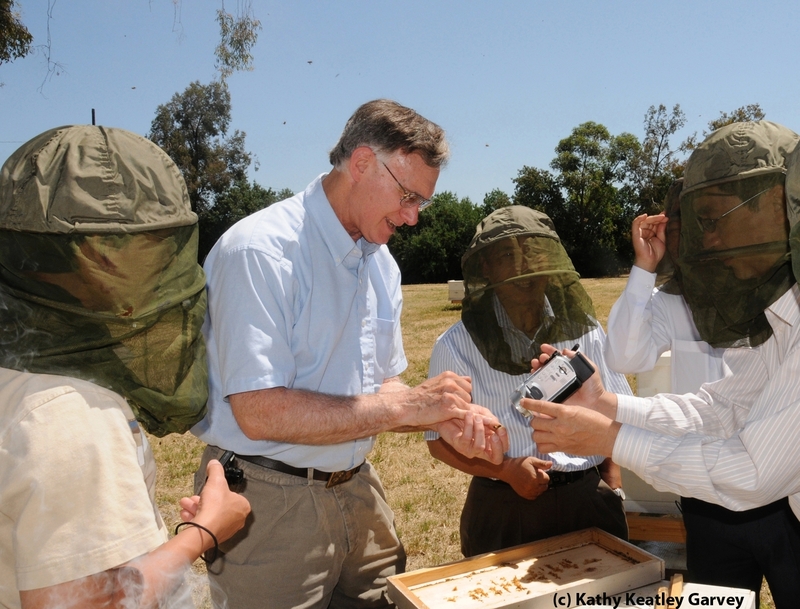 His doctoral research focused on the epidemiology of a viral disease of larval honey bees, sacbrood virus. The nationally awarded plaque “bee-speaks” of his work.